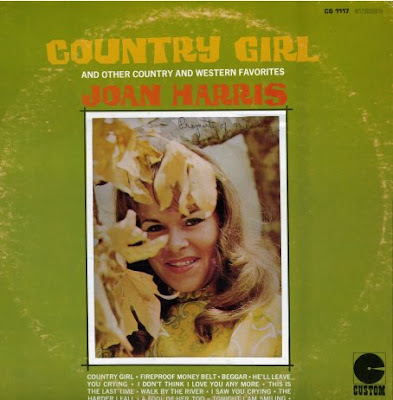 Joan Harris. Sounded familiar, I must know the name from somewhere. OK, maybe not. But anyway, this is probably from the later 60's or the earlier 70's, and it's pretty decent country music. She doesn't have what I'd consider a classic country voice, but I'm no expert. Ironically, the song she sounds least country to me on is "Country Girl." There's a rocker, "Fireproof Money Belt," and what sounds to me like the female version of Jim Reeves "He'll Have To Go," the side A closer "A Fool Of Her Too." You might notice that a few of the songs end a little abruptly, and for once that's not sloppy wav editing on my part. They really cut it that way. I'm guessing Custom was one of those old bargain imprints, and that these songs are from elsewhere. Either that, or she was a total unknown and this album was proudly for sale at your local Alpha Beta. Whatever the case, this is all of side one.